A letter issued by the Ministry of Human Resources Development (HRD) on August 24, 2018 to the newly-appointed Vice Chancellor in charge of Manipur University “to undo the changes relating to the replacement of the present Registrar (in-charge) of Manipur University,” has evoked reaction in the Manipur University on Saturday. The matter came to light when Manipur University Students’ Union (MUSU), Manipur University Teachers’ Association (MUTA) and Manipur University Staffs’ Association (MUSA) issued a joint press note on Saturday evening following an emergency joint meeting of the executives with the MUTA vice president Prof RK Gambhir Singh in the chair. The members in the meeting, according to the press note, drew the attention of the President of India, who is the visitor of Manipur University (MU), Manipur Governor, who is the chief rector of MU, HRD Minister and Chief Minister of Manipur for their timely interventions into speedy restoration of the normalcy in the MU. 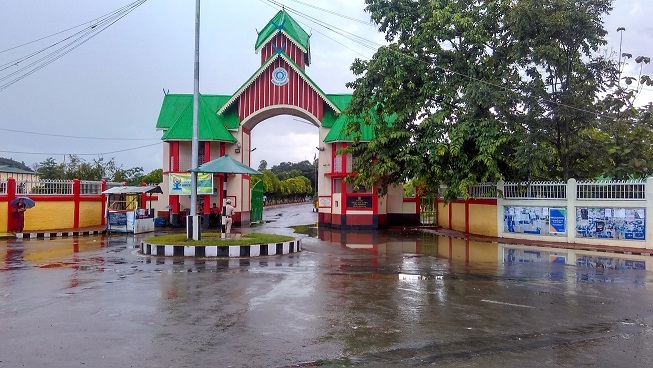 “The members expressed happiness about the return of normalcy in the campus after protracted impasse of 85 days over the demand for removal of Prof AP Pandey from Vice Chancellorship of MU and gratefully acknowledged the kind initiatives of Governor and steadfast attention of chief minister of Manipur,” said the note which was jointly signed by general secretaries of MUSU, MUTA and MUSA. “They extended their whole-hearted support to the new Vice Chancellor and appreciated his prompt initiatives towards clearing of administration backlog including appointment of statutory officers, examination backlog including declaration of the undergraduate examination results and scheduling of pending MA/Msc semester examinations,” it stated. In a letter to the VC in charge of MU on August 24, Deputy Secretary Surat Singh of HRD asked to undo the changes relating to the replacement of the present Registrar (in charge) immediately and send a compliance report. It may be mentioned that VC in charge of MU Prof W Vishwantah had directed Director Prof Sh Dorendrahit Singh of Internal Quality Assurance Cell of the University to perform duties of Registrar (in charge) for 30 days in place of Prof M Shyamkesho. Without delay, the new Registrar (in charge) Prof Dorendrajit in a notice on Saturday requested to all the employees of MU to attend office on Sunday (August 26) in view of the urgent pending works of the University. “The employees shall be compensated the said day on a convenient day,” the notice added.